Bob Holness, who has died at the age of 83, was known and loved by millions as the host of popular game show Blockbusters. Yet he was also a member of that exclusive band of actors who have played the part of James Bond 007. He was given the role by South African Radio' s English language service in a 1956 adaptation of Ian Fleming's Moonraker. He later recalled that, at the time, he had never heard of Bond. "But it became an amazing part to play and the response from listeners was terrific." Robert Wentworth John Holness was born on 12 November 1928 in Natal, South Africa. But his parents brought him back to his father's birthplace, Kent. He studied at Ashford Grammar School and Maidstone College of Art before returning to South Africa with his family, at the age of 25. He began work as a printer but quickly left to pursue his love of acting with an English repertory company that had begun performing in Durban. Within 18 months he was a regular performer in radio drama and had begun presenting his own show Calling to Youth which featured visiting British and American artistes. By now he had met and married his wife Mary. Attracted by the increasing potential of television the couple decided to return to the UK. He arrived in 1961 with no job and no prospects. But he approached Granada just as the company was looking for a complete unknown to host a new panel game, Take A Letter. Holness was given a three-year contract with the Manchester-based company, during which time he presented quiz shows and documentaries and read the local news. Holness joined the BBC Light Programme in 1964 as a freelancer presenting various record programmes including Midday Spin, Housewives Choice, Swingalong and Roundabout. He also continued to present TV programmes, appearing on Out of School and Transworld Top of the Form. Can I have a P please, Bob? In 1967 he began a stint as one of the team of presenters on the radio show Late Night Extra, which went out live and unscripted, initially on Radios 1 and 2, between 10pm and 12am. ''You can't imagine the feeling of freedom we had," he later recalled. "There were no scripts at all. It was a major departure for the BBC." He stayed with the programme until 1975 although, in his final four years, it was only broadcast on Radio 2's AM frequency. He moved to the commercial talk station LBC, initially as the airborne traffic reporter, but was soon co-hosting the AM show with Douglas Cameron. It was a massively successful partnership, twice winning Holness the accolade of Joint Independent Radio Personality of the Year. In 1983 he began a ten-year stint as the host of the ITV quiz series Blockbusters and became something of a teenage cult figure. It also gave him financial stability for the first time in his life, after years working as a freelancer. The programme generated a number of catchphrases such as "Put Yourself on the Hot Spot" as well as the occasional snigger when someone asked "Can I have a P please, Bob?" ITV axed the show in 1993. But it was snapped up for a while by Sky who continued to use Holness as the presenter. Maintaining his radio career, he moved from LBC in 1985 to present the BBC Radio Orchestra's Tuesday night selection of the best in popular music on Radio 2. He also presented the BBC World Service request show Anything Goes, a weekly anthology of words and music which brought him an international following. 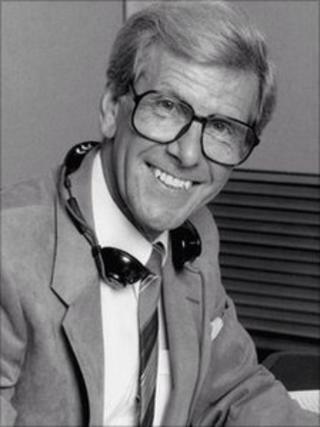 And he stood in for other presenters and fronted his own shows, including Bob Holness Requests the Pleasure and Bob Holness and Friends. He was the presenter of Call My Bluff, the cerebral BBC TV panel game, when it was axed by the Corporation in 2002 after 27 years. Holness criticised the decision, attacking what he called the trend towards quiz shows based on avarice rather than education. His health began to decline in the late 1990s after a series of mini strokes, culminating in a more severe attack in 2002 which induced temporary paralysis. Despite this he continued an exhausting round of public appearances and voice-overs until being diagnosed with coeliac disease in 2005. Bob Holness was the subject of a myth that he played the saxophone on Gerry Rafferty's 1978 hit Baker Street. The actual performer was Rafael Ravenscroft. Ever the joker, Holness gleefully played along with the story - claiming, furthermore, that he was also the lead guitarist on the Derek & the Dominoes song Layla.